Is that a Lamb or a Bedlington Terrier? The Bedlington Terrier, named after the Northumberland town in England was used by miners for hunting and catching vermin. She was also able to hunt foxes, hares and badgers and so, was popular as a poacher’s buddy. Sadly, the story gets darker with miners using the breed for illegal dog fighting out of public view. It is said this adorable canine is often described as having the look of a lamb and the heart of a lion. Her soft, wooly coat would turn any sheep’s head. The Bedlington is a celebrated pet to many a family. She is friendly, playful and one of the calmest of the terrier breeds. Independence is a common trait to terriers and amongst other things, she is a skilled hunter. She’s so lovable, especially with that gentle look but don’t forget where she’s come from… the tough and determined terrier lays just beneath the surface with this loyal and energetic dog. She’s lively and bossy and does well to have a steadfast owner who appreciates her personality, delivers positive training and meets her exercise needs. Her head shape (hidden under that fleece) is shaped much like a sight hound. The body type delivers high speed and quick turns and her small stature allows her to climb down into underground dens. There is some disagreement still today about the totality of her breed origins but the talk around town includes the otterhound, poodle and whippet. Her grey/white coat (which lightens in colour with maturity) requires clipping about every eight weeks and sheds very little. 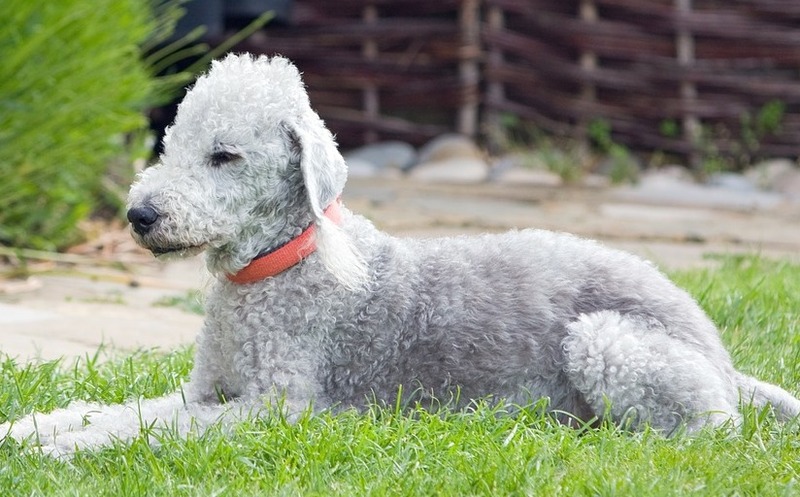 You will find Bedlington terriers vary in colour from blue right through to a sandy hue. She also weighs very little with adult males and females averaging about 8 to 10 kilograms. Owners tend to favour a grooming style which resembles the ‘lamb’ look. Who could blame them?